The net profit of Chinese corporation China Merchant Port (CMPort) increased by 14.3% in 2016, amounting to 5.5 billion HKD (700 million USD). The container turnover of terminals in the investment portfolio of the operator increased by 14.5%, to 95.77 million TEU, approaching the target of 100 million TEU planned for the next year. The CMPort terminals handled 72 million TEU in mainland China, which is 17% more than an year ago. According to the report, the increase was mainly due to the effect of the acquisition of a 21.05% stake in Dalian Port operator in the first half of the year. The turnover of terminals in the ports of Hong Kong and Kaohsiung (Taiwan) increased by 11% and 13% respectively. The aggregate traffic through foreign terminals increased by 5.7% to 17 million TEU, mainly due to 30% increase in transshipment volumes in the port of Colombo in Sri Lanka, which reached 2 million TEU. CMPort deputy head Hu Jianhua noted that on the eve of launching new alliances of carriers from April 1, 2017, the corporation invested in assets located in key transit ports. The turnover of Colombo International Container Terminals, which is 85% controlled by the group, exceeded last year 2 million TEU, while its capacity is 2.6 million TEU. So, to ensure further growth, CMPort participated in the tender for the right to build the East Container Terminal, a new container terminal in Colombo, the construction of which should provide the port with leadership in the transshipment market for containers in Asia. Also in November last year, the Sri Lankan government agreed to sell CMPort the 80% stake in the port of Hambantota, located about 250 km southeast of the port of Colombo, for 1.1 billion USD. The company plans that in 2017 the turnover of terminals in its global portfolio will exceed 100 million TEU. Last year, the managing director of the holding, Bai Jintao, said that the CMPort development plan is based on the concept of the Economic Silk Road Belt, which determines the geography of the corporation’s expansion. CMPort began aggressive foreign expansion in 2008 and now has assets in more than 320 terminals in 29 ports around the world, including Belgium, Djibouti, France, Côte d’Ivoire, Malta, Morocco, Nigeria, South Korea, Sri Lanka, Taiwan, Togo, Turkey and the United States. 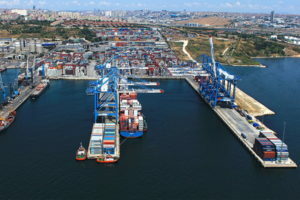 Last year the name CMPort was mentioned in connection with logistics projects in Tanzania, Belarus, the Baltics.